Hungry for Truth is an initiative funded by the South Dakota soybean checkoff that helps farmers and consumers connect in conversations about how food is produced on today’s farms. Each year, Hungry for Truth hosts Farmer Empowerment Training Sessions to help producers have more effective conversations with consumers. Below is a conversation with Kristin, highlighting how she advocates for agriculture, what she’s learned through her involvement with Hungry for Truth and why it’s important to find common ground. How do you currently advocate for agriculture? With a background in marketing, I’m very pro social media. 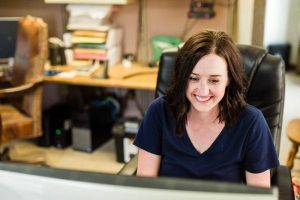 I manage our ranch’s Facebook page, and it’s important to me to be very open about what we do and how we do it online. We utilize a lot of photo and video content to show our processes and how we care for our livestock. We also promote open dialog among our followers. How did you hear about Hungry for Truth? I first heard about Hungry for Truth when I moved back to the ranch. My mom was part of the South Dakota Ag and Rural Leadership program and learned about the initiative. I loved the idea because it promotes positive communications. We live in a divided world on many fronts. Our food and how it’s produced shouldn’t be another thing that separates us. It should bring us together. It’s so important for farmers and ranchers to understand the questions and concerns consumers have about their food and the way it’s produced so we are open to having conversations that benefit everyone. 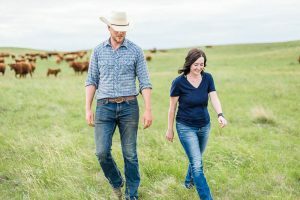 This initiative not only connects producers and consumers, it also connects farmers and ranchers with other farmers and ranchers across the state. What did you think about farmer empowerment training? Sometimes trainings can be abstract and vague, but this event was hands on and specific, making it an incredibly valuable experience. We acted out how conversations should go and what we as producers can do to improve our communications. It really is amazing to see how changing the way you say something can change the entire direction of a conversation. I learned so much about how consumers feel about their food and the way its produced. The session also taught me to ask questions up front to get a better understanding of their concerns and to respond in a way that finds common ground between us. So rather than listening just to respond, we need to listen to fully understand. The conversations become much more open when we focus on what makes us the same rather than what makes us different. I would highly recommend this training to other farmers and ranchers. There are a lot of important takeaways from an event like this. I could attend five more of the same session and still learn something new each time! If you’re a farmer or rancher who wants to attend a Hungry for Truth farmer empowerment training in 2019, email hungryfortruthsd@gmail.com to be added to the invitation list. Visit HungryforTruthSD.com to read about Kristin’s ranch and learn more about the initiative.